The holidays were very bright for a lucky California family who entered a drawing at the California State Fair last summer. The winners received a $2500 Target Gift Card in time to buy all their important gifts. Global Connections, Inc. (GCI), the highly respected resort developer, travel club fulfillment and service provider, proudly announces the Grand Prize winners in an annual giveaway held by its authorized distributor Global Travel Network (GTN). 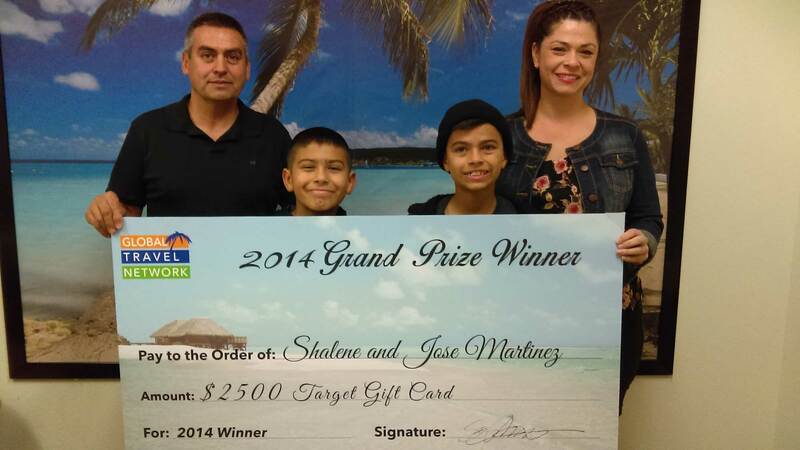 According to Scott Nichols, President of GTN (http://www.GlobalTravelNetwork.com), Sharlene and Jose Martinez of Live Oak, California were named this year’s grand prize winners in the annual drawing. The couple’s name was selected randomly from entries made at various venues during the past year, including Home and Garden Shows, International Auto Shows, and booths at state and county fairs to name a few. Headquartered in Salt Lake City, Utah and open since August of 2002, GTN has three sales centers. In addition to Salt Lake City, GTN also has centers in Denver, Colorado and Roseville, California. GTN is a distributor for GCI and its travel club product, Global Discovery Vacations, which provides a membership based on “Star Credits”, allowing members to select a vacation program to fit their lifestyle and budget. GCI is the owner and developer of resorts in California, Florida, Tennessee, and Colorado and further owns and leases multiple resort condominium units throughout the United States, Canada, Mexico and the Caribbean. With distributors and sales centers located throughout the United States including Florida, Illinois, and New York to name a few, Global Connections (headquartered in Overland Park, KS) (www.exploregci.com) provides Global Discovery Vacations’ members with a host of benefits and vacationing options including condominium stays in 700 North American resorts, cruises, campground options and a buying service. To become a distributor or learn more about Global Connections, Global Discovery Vacations and the company’s products and services, call Melanie Gring at 561-417-7559.